Oakville Ballet is a regional youth ballet company comprised of students from its affiliated school, Oakville School of Classical Ballet who attend the pre professional program. The mission of the Oakville Ballet is to provide development and performance experience for aspiring young dancers throughout their classical ballet training, while helping the community to develop an appreciation for the performing arts. 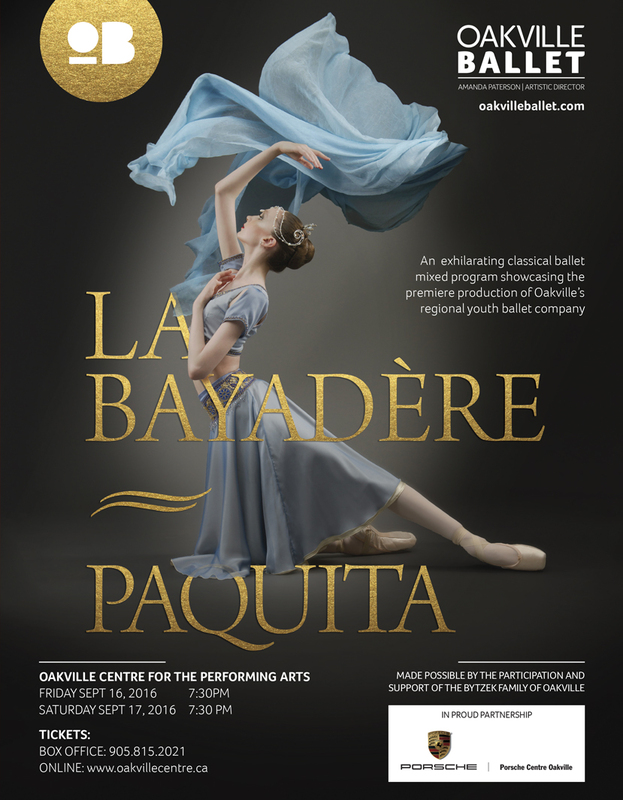 Each year, Oakville Ballet aims to produce one classical full-length production. For the 2016 Season, commencing September 16 and 17 2016, Oakville Ballet will premiere a ballet in two acts combining the ballets of Marius Petipa to the strong rhythmical scores of Ludwig Minkus. Act I will comprise of Petipa’s celebrated ‘Kingdom of the Shades’ excerpt extracted from the full-length ballet, La Bayadère (1877). Act II, will showcase the dancers in Paquita – Grand Pas Classique.